Who Said Garba Can Only Be Performed In Navratri? SSGD Introduces ‘Re-Live’ Navratri To Celebrate All Year Round! The whole world dances on Garba in the nine nights of Navratri. And that remains the perception of the world - that one can do Garba only during Navratri. In the world's biggest dance festival, about a million people participate in Mumbai alone to dance to the devotional songs of the Goddess and folk songs of Gujarat. However, nobody ever said that you only have to dance on Garba tunes just during Navratri. To beat this notion, world's biggest Garba school - Sonis School Of Garba Dance (SSGD), has for the first time, introduced the concept of 'Re-Live Navratri', where not just students of SSGD but everyone is welcome to be a part of the celebration. This is a fresh change for those who love Garba and Dandiya but only get to dance during Navratri. Based in Mumbai, founders of SSGD Jigar and Suhrad Soni believe that Garba is just like any folk dance across India and does not need a specific defined time to be danced on. 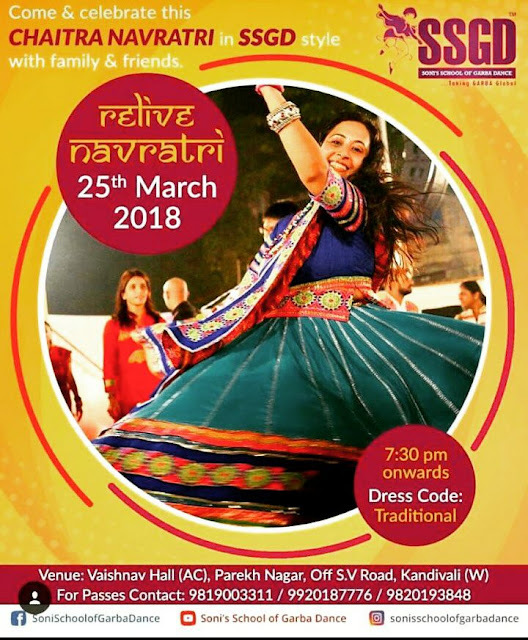 SSGD will be celebrating Ram Navami and Chaitra Navratri in true traditional style in the 'Re-Live Navratri' event on March 25. About SSGD: Sonis School of Garba Dance, that started about 20 years ago is the world's biggest Garba dance school based in Mumbai. The founders and mentors Jigar and Suhrad have taken it to newer heights by being felicitated at the House of Commons in the UK. The Soni brothers have taught more than 10,000 students so far and aim at increasing the number year after year. SSGD has been recognized by UNESCO for its contribution to Indian folk dance culture and has performed in United Nations as well. SSGD has its presence worldwide in countries like UK, UAE, Switzerland, Ireland and USA. The Soni brothers were invited to perform at the Trafalgar Square by the current Mayor of London, Sadiq Khan. They will be visiting London again to conduct more workshops on demand in UK. They also recently won the Transmedia Gujarati Film awards for the best choreography in the film "Mad For Each Other"